We’ve only gotten tiny snippets of some of the latest ground forces for Rogue One: A Star Wars Story, but one kid’s playground adventure gives the rest of us a solid look at the newest Scarif shoretroopers. Walmart released this commercial for Star Wars “Force Friday” to promote its Scarif shoretrooper action figure. Previously, these guys only showed up for about five seconds in the previous trailers. While the commercial doesn’t look to be actual footage from the film, it does give us some hints as to how these new shoretroopers fight and interact. Let’s just say they know how to use an AT-AT as a shield, at least temporarily. The planet Scarif is set to be one of the main locations in Rogue One, being the main construction facility that’s used for the “Imperial war machine,” also known as the Death Star. 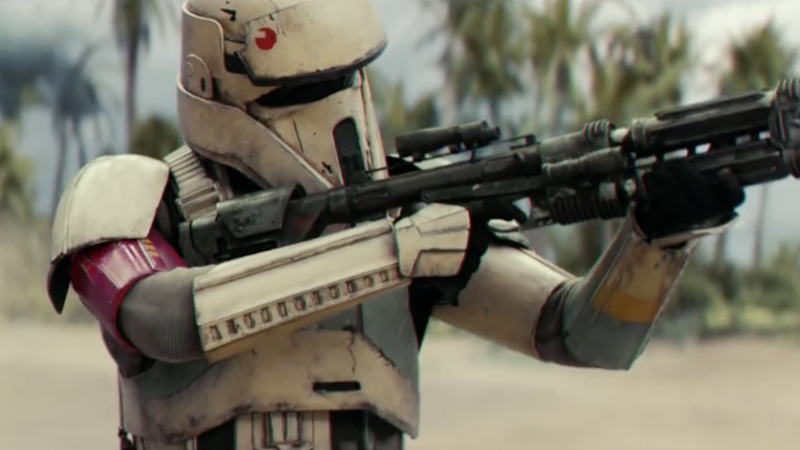 According to the Star Wars databank, shoretroopers are the specialist stormtroopers that protect the facility on Scarif, patrolling the beaches and bunkers of the planetary facility. There’s a lot of speculation about these shoretroopers— for example, whether the insignia on their helmets and suit customization hints at more independent troopers than we’re used to seeing. Stormtroopers are typically stripped of their individuality during their rigorous training, but we saw Finn struggle with his identity as a stormtrooper in the beginning of The Force Awakens, so it’s not a new concept in this new generation of Star Wars films. Plus, signs are pointing to multiple regiments working under different commanders. Could that mean different types of training, and perhaps interpersonal conflict among the ranks? I guess we’ll see. Rogue One: A Star Wars Story comes out December 16.